Click on the elevations to see the products details. No matter how strong or placid the winds get int your neighborhood, MGM's Series 92xx and 93xx vinyl swing door will pass even the toughest coastal building code requirements. Whether it is new construction or replacement, builders appreciate the easy installation straight from our factory with our adjustable hinges for height and camber, a welded frame and 4 9/16" vinyl jamb. 1" INSULATED GLASS - energy savings add up with these doors and a full inch of glass keeps the outside noise, outside. Plus, you don't have to worry about seals breaking and the inside of the door fogging up. 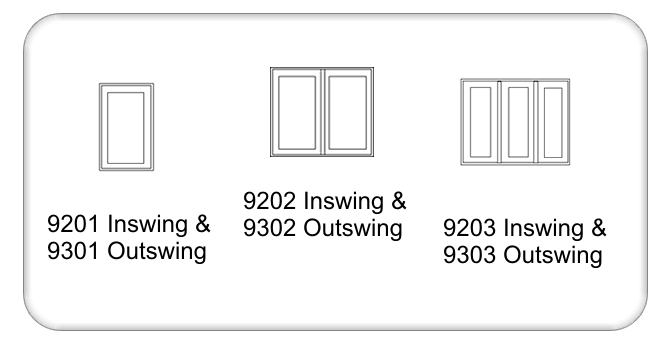 SINGLE, DOUBLE, OR TRIPLE -whether you need a single panel, double panel or a three panel door, we've got what you need. VINYL BRICK MOULD - whether you need a single panel, double panel or a three panel door, we've got what you need. VINYL THRESHOLD WITH ALUMINUM PLATES -no need to worry about heavy foot traffic - our doors are made for it. MAINTENANCE FREE - as with all MGM products, our vinyl swing doors are maintenance free and never need painting or staining inside or out. Below are the details for this series. Click on the tab of your choice to see that product's details. Call your salesman for details. Click to open the NFRC Product Certification Authorization report PDF for the 9200/9300 Inswing/Outswing door.